 Home › Politics News › Father Mbaka Finally Tenders His Apology To Peter Obi Publicly. Father Mbaka Finally Tenders His Apology To Peter Obi Publicly. Presidential Candidate Peter Obi Publicly. 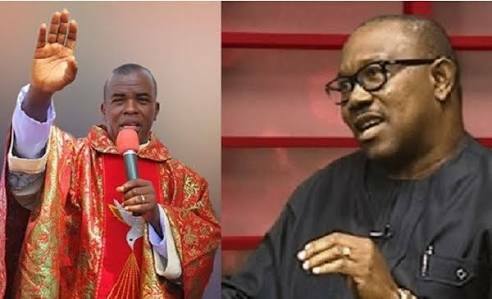 Catholic priest and spiritual director of Adoration Ministries, Father Ejike Mbaka has apologized to the PDP vice presidential candidate and former governor of Anambra State, Peter Obi. Mbaka was criticised for 'embarrassing' Obi recently at the church's bazaar ceremony over his refusal to disclose what he would donate to the church, for which the priest has now apologised.